Original era manufacture. 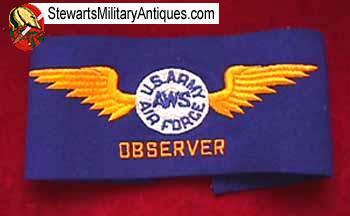 US Army Air Force AWS Observer Armband. Multi-color cotton embroidery, on an Army Air Corps blue wool backing.This organization was under the control of the AAF and had a high percentage of female volunteers in its ranks.We have several examples in stock, all show very, very minor mothing from storage.